The three Broadway princesses guest on Giada De Laurentiis’ Winner Cake All. On January 21, theatre fans will see three familiar faces on Giada De Laurentiis’ new Food Network show Winner Cake All. 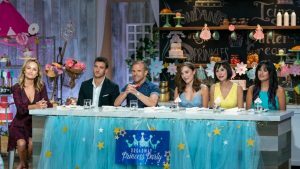 During the episode, “It’s a Broadway Princess Party,” which airs at 10PM ET, two-time Tony nominee Laura Osnes, Tony nominee Susan Egan, and Courtney Reed will see if the bakers can impress them with a cake fit for the cast and crew of their Broadway Princess Party concert series. Osnes, Egan, and Reed are marking the third year of the live concert series and want a cake to mark the celebration. One baking team will win $10,000 and the honor of serving their cake. Osnes was Tony-nominated for her performance as Cinderella in Rodgers + Hammertsein’s Cinderella on Broadway. Reed originated the role of Princess Jasmine in Broadway’s Aladdin, and Egan originated the role of Belle in Broadway’s Beauty and the Beast. The concerts feature favorites from the princess stories, plus anecdotes from the three performers about their stage time as famous princesses. The concert is a favorite at Feinstein’s/54 Below in New York City, and continues engagements across the country. The shows have often welcomed special guests with princess pedigrees, such as Liz Callaway, Christy Altomare, and Arielle Jacobs.